Dutch company Upp! 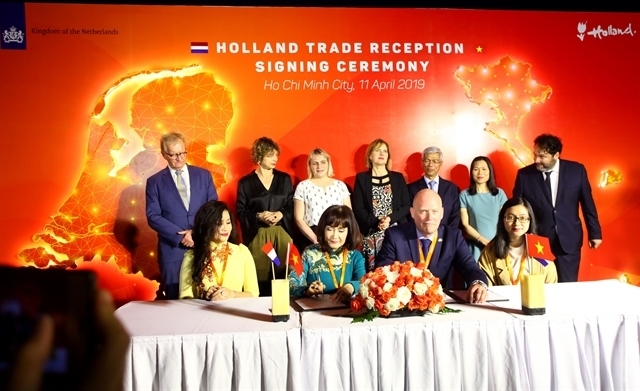 UpCycling Plastic and Toàn Hải Vân JSC (a member company of TTC Land) on April 11 signed a co-operation agreement to build a cyclic plastic-waste disposal plant on Phú Quốc Island. Under the agreement, the two companies will establish a joint venture, with the aim of solving the problem of plastic waste in the island and contributing to a cleaner and greener world. The joint venture will recycle plastic waste from the sea, beaches and landfills into materials used for building local resorts and hotels, and infrastructure projects. In its first phase, a pilot plant with one to two production lines will be built to treat and turn plastic waste into basic construction materials such as pavement bricks, roof tiles, boards and columns. The plant, which will be in operation no later than November, is expected to have a capacity of 3,000-4,000 tonnes a year by 2020. Currently, the company's products are mainly environmentally-friendly PP and PE that can be used for many urban buildings. The company conducted research on building a plastic waste recycling plant in Việt Nam in order to contribute to dealing with waste in the country. Huỳnh Bích Ngọc, chairwoman of Toàn Hải Vân JSC, said: “Over the years, the amount of waste that Việt Nam has discharged into the environment has increased day by day. We can see and feel the effects of waste on land, in the ocean and everywhere, but there have not been sufficient solutions for the problem. The joint venture’s products will be used to build the artificial Hoa Sen island (belonging to the Vịnh Đầm Complex with the commercial name Ocean Lotus Island).